Shenqu (shen-chu) is an unusual preparation of wheat (or sprouted barley) combined with herbs used as a digestive aid and as a component of treatments for acute ailments, such as "summer heat syndrome." The Chinese names for this material, shenqu (spirit ferment) and liuqu (six ingredient ferment) refer to its method of preparation, as a fermenting mass. Traditionally, wheat flour and wheat bran are combined with herbs and formed into small pieces (sometimes as bricks), put in a basket and covered with flax leaves or paper mulberry leaves (Broussonetia sp.). This is kept warm, which allows naturally occurring yeasts to grow, eventually sprouting yellow hyphae. After about one week, the pieces are taken out of the basket and sun dried. This is the shenqu. The digestion-promoting function of shenqu is likely due to the yeasts, which are rich in amylase and thus aid digestion of grains; yeasts also have other digestive enzymes in lesser amounts. Most of the other herbs in the original preparation have some functions as digestive aids: polygonum (shuiliao) is specifically used to treat "summer heat" syndrome with digestive symptoms, such as abdominal pain, vomiting and diarrhea; ching-hao, also for summer heat, is considered supportive of spleen/stomach functions. The formulas listed above, with herbs such as hoelen, cardamom, pogostemon, and citrus, provide some small amounts of additional digestive aids. The amount of wheat, wheat germ, or sprouted barley used to make these preparations (in Japan, rice may be used) is about 38%. After fermentation, much of the original grain may be digested by the yeasts to yield other substances, so the amount of original grain components left may be small. Very little analysis of shenqu chemical constituents has been reported; the existence of amylase has been confirmed and essential oils are noted. The grain component will retain traces of gluten. Yet, shenqu has been recommended by Western practitioners of Chinese medicine as a digestive aid for those with food sensitivities, including celiac disease, so it probably contains a small enough amount that it is not problematic except for those with the greatest sensitivity. As a precaution, some Chinese herb companies list products with wheat and barley in any form as ones to be avoided by those with gluten sensitivity. The original product came from Fujian Province and was first recorded in the Yaoxing Bencao (ca. 600 A.D.). The purpose of the fermented grain, when first developed, was as a starter for making wine. The role of the wheat was simply to provide the nutrient base for growing the yeasts; the role of the herbs was to provide some medicinal properties (lowering qi, relieving the surface, promoting digestion), based mainly on the folk uses of the fresh herbs. Shen Chu Cha is a traditional old style Traditional Chinese Medicine formula. It needs to be boiled with water, reduced in volume by one third, stained and then drunk. 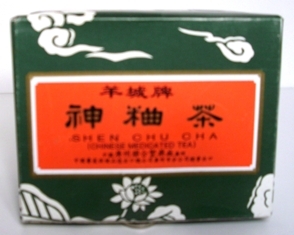 Shen Chu Cha is a refined blend of selected natural Chinese herbs. It has been used in Traditional Chinese Medicine for both treating problems of the digestive system, in particular indigestion, vomiting, diarrhea, stomach pain, flatulence, gas, fevers, colds, headaches heatstroke and poor appetite. Directions: To be taken orally, 1 cube piece each time, combine together with 3 pieces of fresh ginger, add 4 bowls of water, bring to boil and reduce to a simmer for 45 minutes to 1 bowl. Drain and drink warm once a day. *This product is recommended to be taken two hours apart from all other medications. Not suitable for pregnant or breastfeeding women.